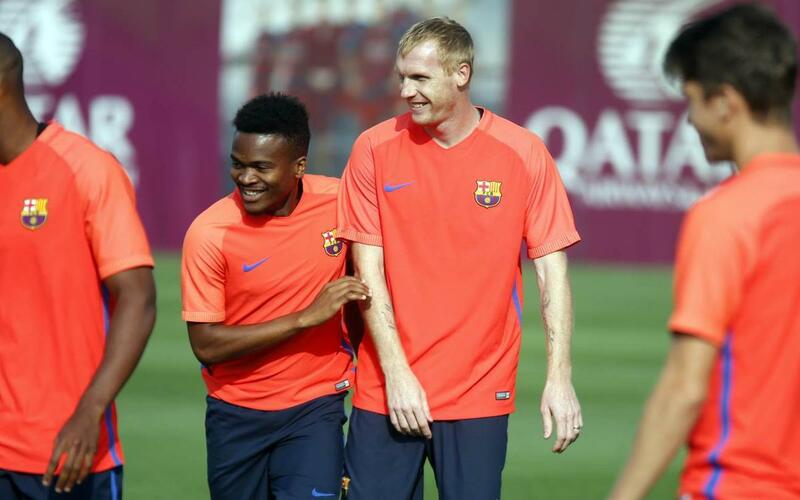 With 16 players away on international duty from 31 August to 6 September, FC Barcelona's training sessions are in search of new faces to participate. First teamers Ter Stegen (Germany), Jordi Alba, Sergi Roberto, Piqué, Sergio Busquets, Paco Alcácer (Spain), Denis Suárez (Spain U21), André Gomes (Portugal), Cillessen (Netherlands), Lucas Digne,Samuel Umtiti (France), Neymar (Brazil), Lionel Messi, Mascherano (Argentina), Luis Suárez (Uruguay), and Ivan Rakitic (Croatia) are all absent in the coming days. Which is why, on Wednesday, the first team players still around trained with Barça B, in a session held on Field 2 at the Ciutat Esportiva Joan Gamper. Head coach Luis Enrique Martínez wasn't there either. The Asturias-native is in Nyon, Switzerland Wednesday, attending the UEFA Elite Club Coaches Forum.